Why Worry About My Samples Pitch? Having an awareness of the spectral content and frequencies present in each instrument and sample you use in your track can be very powerful. Part of our goal when mixing is to make sure there is enough room in the frequency spectrum for each instrument and sample at any given time. This helps to create balance in your mix and will make your track sound better overall. To drill down even more, it’s good to know what notes your instruments and samples coincide with. Music theory says that the notes on our keyboard all represent different frequencies and pitches with certain mathematical relationships that define them. For instance, note B4 has a frequency of 493.883 Hz, and note D6 is 1174.66 Hz. With an awareness of the pitch of our samples, we can then make better sample choices to match what scale we are using. A general rule of thumb is to choose a scale for your track and use it as a guide for which notes to use. Finding your instruments pitch/notes is usually pretty easy. Just open the Piano roll and you can see everything laid out there. But finding the pitch or note of a sample is a little less obvious. Remember, the goal of this is to pick samples with a note that fits our scale, or to change their pitch to match a note in our scale. Let’s take a look. Note: You will need Edison for this method to work. Edison is included in FL Studio Producer Edition and up. Check the FL Studio feature comparison page on the Image-Line website for more details. Your kick has a pitch too! Your bassline and kick will sound much better together when they are at or near the same frequency, or at least part of the same scale. 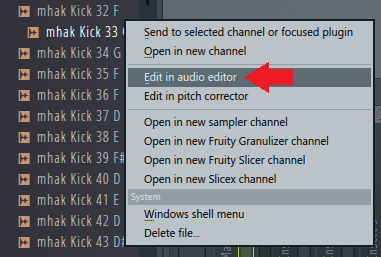 Right-click on the kick in the browser and click Edit in audio editor. 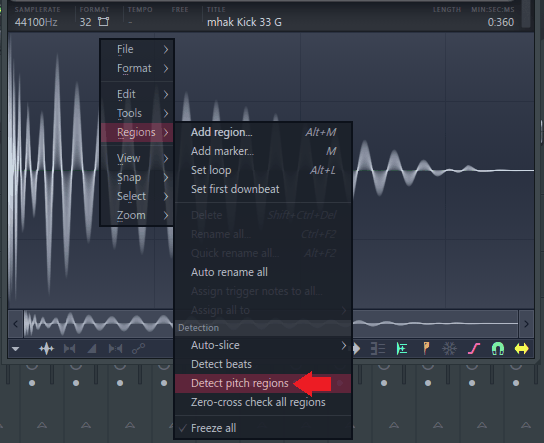 This will open the kick sample in Edison. Right-click on the sample waveform in Edison, go to Regions, and click Detect pitch regions. Edison will automatically identify what note your kick falls on. 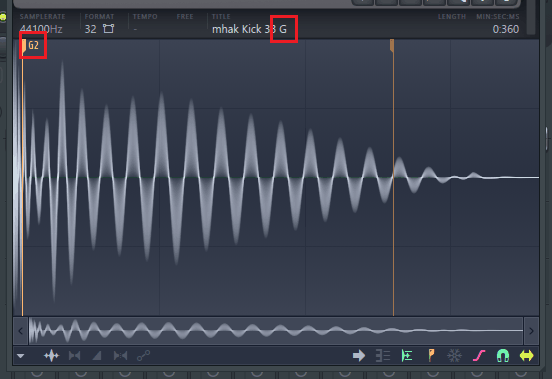 This kick coincides with the G2 note, or 98 Hz. We can see that the pitch determined by Edison is the same as the pitch in the sample file name. Everything checks out! For this specific kick, you’d want to match it with G in your bassline, or use an overall scale that contains G.
The technique outlined above works well for samples that we don’t know the pitch of. But rather than going through this process, it makes more sense to use a pre-tuned sample. Here is a great collection of 500 free kick samples made by Markus Hakala and compiled by How to Make Electronic Music.com. The sample file names call out the note for the sample. That’s it for today, thanks for reading! If you liked this 100% free FL Studio tutorial, let me know what else you’d like me to cover in the comments, on the Synaptic Sound Facebook page, or YouTube channel.